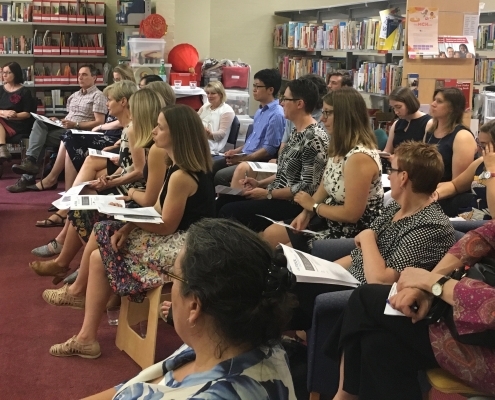 This year, the VicTESOL Annual General Meeting was held on December 6th at the Languages and Multicultural Education Resource Centre (LMERC) in Carlton. 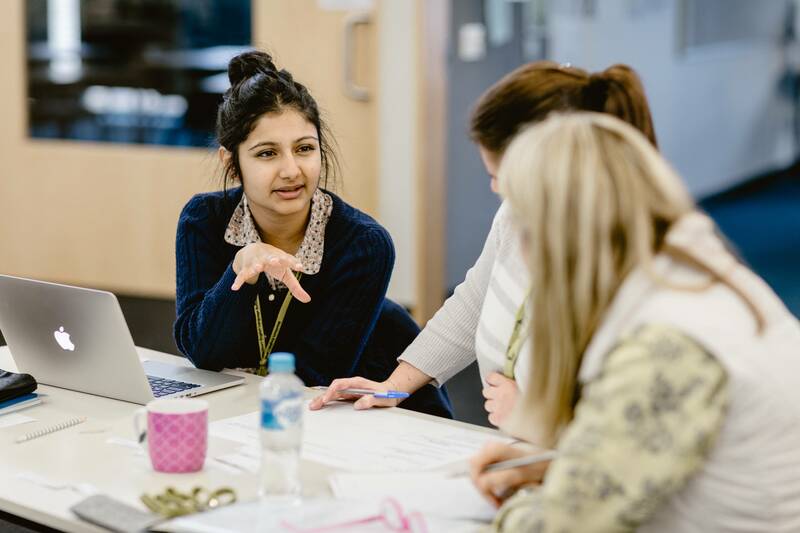 On the night, VicTESOL’s much anticipated Teaching and Learning Cycle project culminated in the launch of a set of resources for teachers across the EAL sector. The 2018 VicTESOL research grant was also presented to well-deserving recipients Dr Julie Choi (Melbourne University), Dr Yvette Slaughter (Melbourne University) and Hayley Black (Carringbush Adult Education). Their project will focus on developing and implementing effective language and literacy pedagogies for low language and literacy learners, through collaborative engagement between teacher educators and teachers. 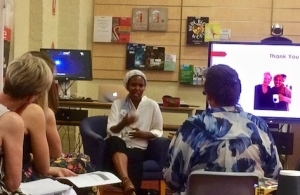 The guest speaker, Nafisa Yussf, vividly recounted her personal experiences as a refugee student within the Victorian school system and attributed her successes to the dedication of her teachers. Attendees networked over drinks and canapés provided by Asylum Seeker Resource Centre Catering. It was a great evening celebrating the contribution of this year’s committee and staff, and welcoming existing and new members to the committee for 2019. I would like to thank the committee for their enthusiasm, interest, commitment and work throughout the year for VicTESOL and the broader EAL community of educators and students. Without their ideas and input the extensive program of activities VicTESOL has undertaken in 2017 would not have occurred. Special thanks to the executive – Shem, April and Mark who have shared their ideas and given much of their valuable time throughout the year in providing support to the undertakings of VicTESOL. They have instigated and sustained a range of initiatives and activities that have added to VicTESOL’s achievements throughout 2017. Much appreciation goes to April who has indicated that she will step down from the role of secretary. April has shown much initiative especially in the area of making links with Indigenous Education groups. Her energy and enthusiasm will be missed. However, April will still be a valued member of the general committee. The past year has been very active for the association in a range of ways. VicTESOL has worked hard to provide an extensive and comprehensive Professional Learning program. 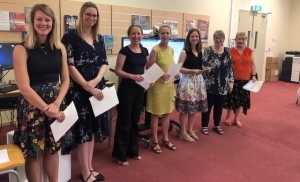 Thanks goes to the Professional Learning coordinator, Catherine McClymont, who has professionally and proficiently organised a range of Professional Learning activities across the Early Childhood, schools, VCE EAL and adult sectors. Also thanks to the Professional Learning subcommittee led by Michelle Andrews. All Professional Learning activities have been well attended and received positive feedback. In 2018, we will continue to develop the Professional Learning program and aim to broaden our partnerships across the sectors so as to provide a relevant and current Professional Learning agenda. We will continue to develop a funding partnership with the Department of Education and Training (DET). A key Professional Learning activity worth noting was one which was co-hosted with La Trobe University in November. 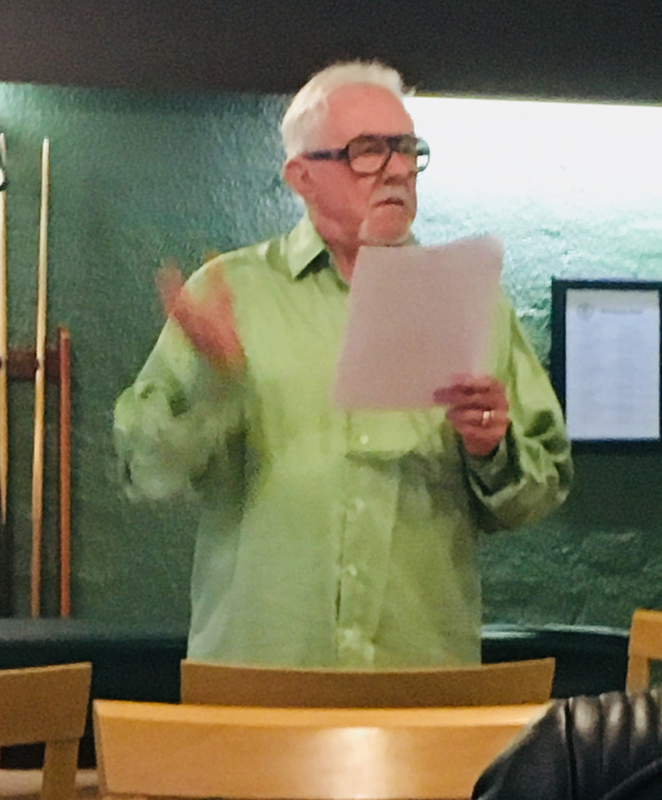 Patsy Lightbown, an internationally renowned teacher and researcher in the field spoke of TESOL theory and practice from the past which is still very relevant in current times. Special thanks to Shem Macdonald for organising this event. The highlight of VicTESOL’s Professional Learning calendar in 2017 was the one-day symposium at the Bastow Institute for Educational Leadership in August. The keynotes addresses presented by Associate Professor Jane Wilkinson (Monash University) and Dr Jenny Barnett (University of South Australia) stimulated us all in our thinking around community responses to EAL learners and who we are as professional EAL teachers. Thank you to all the presenters who shared their practices and ideas. The presentations inspired discussion and had us questioning our current professional knowledge and practices. Special thanks to the VicTESOL subcommittee who supported the planning and operational aspects of the event. Thanks to Jessie and the communications subcommittee who have put together the e-bulletin during the year and promoted VicTESOL activities through the VicTESOL website, facebook and twitter. A new VicTESOL brochure was designed and is now being distributed. We look forward to further developments in the communications area in 2018. 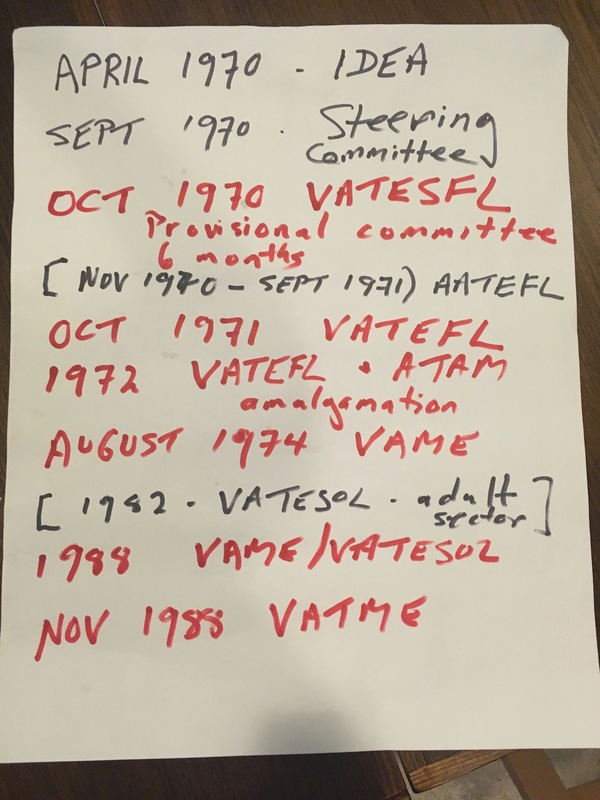 VicTESOL has had an active adult sector subcommittee this year. We look forward to their ongoing support and ideas in 2018. VCE EAL is a priority area for VicTESOL. A number of activities are planned for early 2018. VicTESOL will continue to host twilight sessions for this group of TESOL educators to encourage networking and the sharing of resources. Thanks goes to the membership and policy subcommittee who have worked tirelessly throughout the year. A healthy and active membership is crucial to the ongoing work of VicTESOL. It assists us to improve and consolidate our service. Therefore, I encourage you to consider membership at an individual level and at an institutional level for your organisation. Membership provides you with the opportunity to have a voice in the EAL community and advocate for the needs of educators and learners. Being a VicTESOL member provides you access to EAL networks and professional learning activities. It is a means of professional as well as personal enrichment. Alan Williams will talk more about the VicTESOL research grant which was instigated in 2016. We would like to congratulate the successful applicants. Our thanks go to Shem Macdonald, Alan Williams, and Mark Melican for adjudicating the research grant process. VicTESOL would also like to acknowledge the research work of Katrina Tour and Maria Gindidis (Monash University) who in partnership with Blackburn English Language School have created a website based on their work into ‘transmedia’. In 2018, Margaret Corrigan (Committee Member) will be taking on the convener role of the ACTA adult sector committee. In October 2018, ACTA International conference will be conducted in Adelaide. The call for papers is open. Please see the ACTA website for further information. VicTESOL is providing four scholarships for the conference for vicTESOL members who will be presenting at the conference. Jack Madin has completed his fourth year in the role of Association Officer and has indicated he will continue in 2018. Jack is the face of VicTESOL and keeps the organisation on track – managing memberships, professional learning activity registrations, communicating with subcommittees and members and working closely with the executive and the PL coordinator. We value his knowledge of VicTESOL processes and practices, and his competence in managing the numerous tasks which come his way. In 2017 he has assisted VicTESOL to become a virtual association. VicTESOL is an avenue to connect with the broader TESOL field and the community in general. It provides up to data information about activities and events and is a means for sharing what’s happening in the EAL field at a state level. Finally, VicTESOL would like to thank its membership for their ongoing support. The strength of any association is with its membership base.